3D printing has been all the rage the last few years and many who worked with the printers in the early days of the technology are amazed by how rapidly the industry has grown. A new report from the Freedonia group says this trend doesn’t show any signs of slowing down. 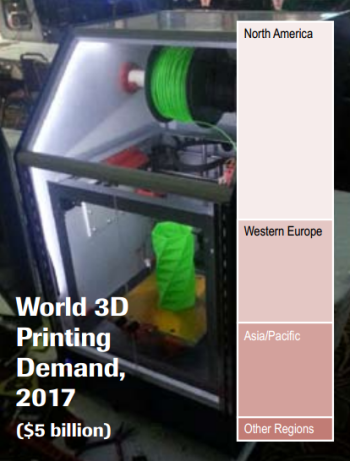 The market research company released their World 3D Printing 2017 report that projects the industry will continue to grow about 20% annual for the next four years. At that point, they believe the 3D printing industry will produce about $5 billion annually, making it a notable player in global manufacturing. They see two big factors in pushing the popularity of the medium. As new innovations come to 3D printing, more major manufacturers will add 3D printing into their process. This will mostly be in the design and prototyping areas of manufacturing, but many will also follow GE’s lead in using 3D printing for actual production as well. As the speed of 3D printing increases, the direct production use of the printing technology will be the bigger boost to mainstreaming 3D printing. The other area is in consumer level printing. Price points of desktop machines are expected to continue their downward trend, making home printers a reality for many more interested consumers and small companies. In addition, we have already started to see retail presence of 3D printing spring up in major cities over the last year. This trend is expected to continue as on-demand printing gains popularity. 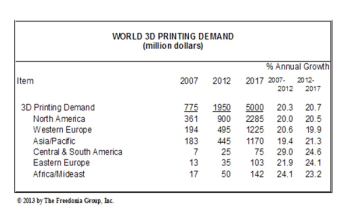 This, of course, just scratches the surface on the trends that will keep 3D printing growing for years to come. But even just looking at these handful of areas, few would disagree that 3D printing has a bright future ahead of it.